Yes. We have a large, centralized, steel and concrete shelter inside our building. We enter our shelter from our inside gym. When your child starts in a new classroom, you will be provided with a curriculum and information sheet. In this packet, a list of requested items will be provided. A simplified list for each age group is listed below. In each room you will find a place for your child’s belongings. Children need: extra clothes, underwear, a blanket for naptime, and a reusable water bottle. We play outside. Middle Earth provides Babyganics Sunscreen for each child. Bring your child ready for outdoor play. How do I pay the tuition? Each family signs a contract verifying the payment amount along with a voided check for ACH payment. Payments are made on a monthly or weekly basis, based on your preferences. ACH payments are required for enrollment. The doors are locked. You will find a keypad as you walk into the breezeway. Each family is given their own private door code for inside access from 7 am to 6 pm, Monday through Friday. Can my friends pick up my child? Our Enrollment Packet provides a section to list the individuals allowed to pick–up your child. Our front desk staff will open our locked door and ask to see their Driver’s License for verification. Will you call me right away if my child becomes sick? Yes. We will call you and as ask for your opinion as we discuss a plan for the day. My young toddler still takes a nap and I am afraid he will become too tired while in your care. Often our younger Toddlers need a morning nap. 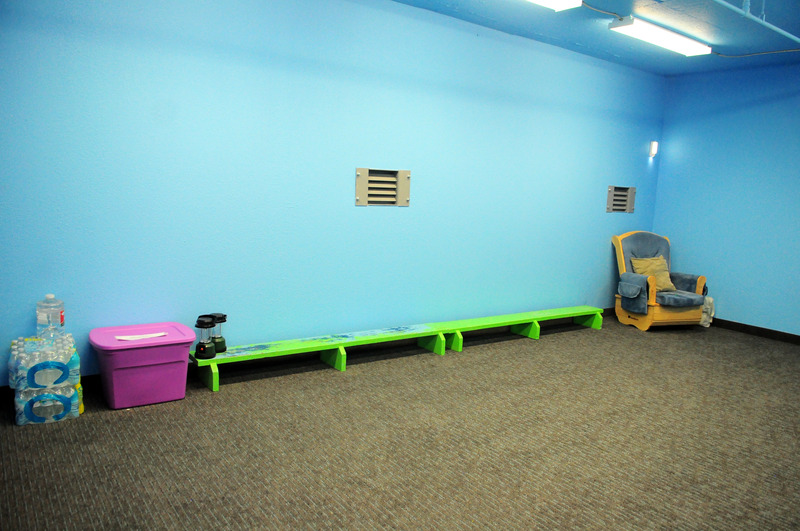 The room is set-up for naptime and the Toddlers that have grown out of the need for a morning nap are taken to the little gym for active play. Are the teachers certified in CPR and First Aid? Within 90 days, all of our teaching staff are certified in CPR & First Aid, complete the Entry Level Child Care Training and Orientation, and annually earn 20 hours of child care training. Many of our teachers have earned their Master Teacher, Child Care Credential. You will find our teacher introductions outside of their classroom door and on our web-site. 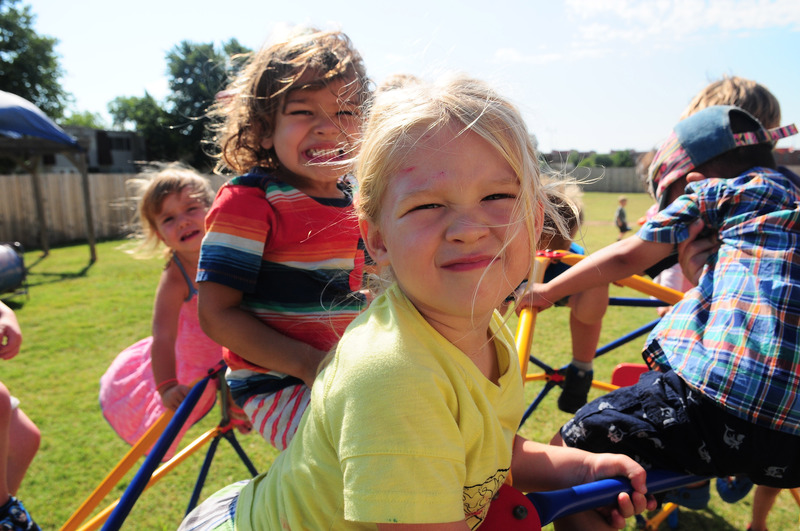 Do you have a Norman Public Schools, Pre-K? Yes. We host a Bright Beginnings, Norman Public Schools, Pre-K classroom. Our NPS Pre-K is available to children that turn 4 years old by the first of September. You can enroll your infant or young child at Middle Earth and stay with us through Pre-K.
Do you have curriculum for young children? Yes. 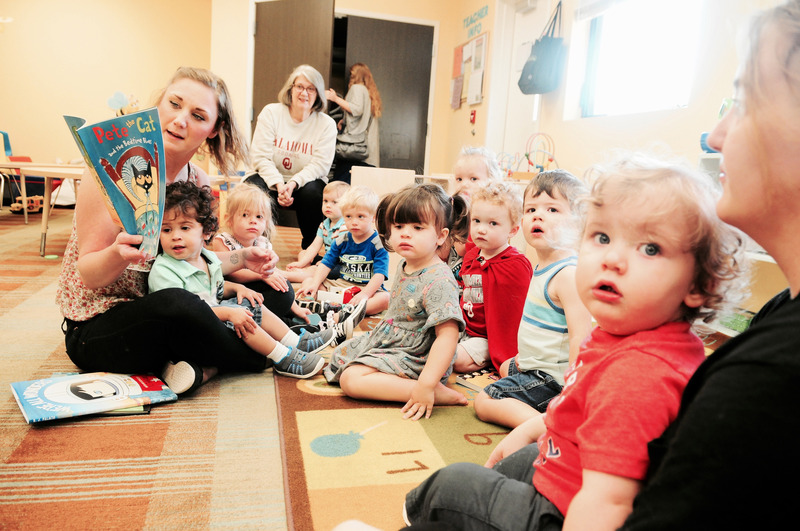 Our weekly Lesson Plans are posted in each room and reference the Oklahoma Early Learning Guidelines for Children, Ages Three through Five and Birth to Three. Our Master Teachers follow their outcome driven annual project plan which lays the foundation for focused and intentional learning experiences designed for school readiness. Each classroom follows a consistent daily routine which engenders confidence and self-esteem both necessary characteristics for children to see themselves as good decision makers. We grow each child’s ability to think and reason by arranging our classrooms in interest areas for purposeful play. Our teachers transition from group time to free play asking, “Which center do you want to play at now? What are you going to do there?” and later ask, “What did you do in the center?” As our children become more efficient using their self-regulation ability and executive function skills their play becomes more robust. While playing in their safe and nurturing classroom community our children practice new vocabulary, hypothesize in the science area, act out real life events by trying on different perspectives in the dramatic play area. Children sort, stack, and manipulate unit blocks, numbers and letters. All of these interest areas are available to our children to explore and construct new understanding as our teaching staff lean in and out offering the next step on the learning scaffold. While growing in academic skills they learn that their friends have different opinions and they learn about the importance of being a friend. Making friends, feeling a sense of belonging beside their classmates and following directions prepare our children for a successful transition into Kindergarten. Our teaching staff honor childhood by consistently maintaining a high standard. Do you have Parent/ Teacher Conferences? Yes. We conduct Parent/ Teacher Conferences twice a year. We use the Focused Portfolio observation tools to document our observations throughout the year and share our observations during the Parent/ Teacher Conferences. The teacher’s observations guide the topics and activities for our classroom curriculum. What is the best time of day to volunteer in my child’s classroom? Parents are always welcome. We read throughout the day. Bring your child’s favorite book for morning or afternoon reading time, sit beside your child at naptime, or rock and feed your baby. We love our families and enjoy growing our partnerships.